We are your voice in Tallahassee. Legislative and Regulatory Representation in Tallahassee addressing tort reform, expanding outpatient opportunities for ASC’s, workers compensation, PIP, etc. Lobbying representation in Tallahassee – independent contract lobbyist. Political Action Committee interviews and endorses pro-medicine candidates for public office. Weekly web conferences for the membership during session to engage members and grassroots network. Host an Orthopaedic Day on the Hill each spring in Tallahassee and participate in an orthopaedic day on the hill in Washington DC. 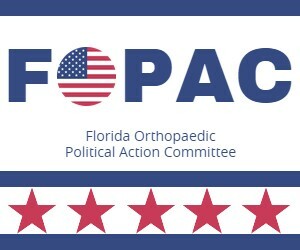 Florida Orthopaedic Political Action Committee Regulatory representation through frequent meetings with the Office of Insurance Regulation, Workers Compensation, Medicaid, Medicare Fiscal Intermediary, etc. Established payer relationships that benefit our members through the ability to address reimbursement issues and challenges directly with the payer or appropriate regulatory bodies. Direct Communication to the Office of Insurance Regulation, Division of Workers Compensation, UnitedHealthCare, Florida Blue, and First Coast Service Options.